SDC Stone Plus Limited is an exporter of granite, marble and slate products for construction, plus products for kitchen and bathroom. It owes its success from its former sister company, SDC Company, which is first established in 1996 in Hong Kong. We have been focusing in fabricating granite products specifically for export. Owning factory with appropriate and adequate machineries and skill labors in Xiamen of Fujian Province in China, we are capable to supply quality products in different sectors. After years of unremitting endeavor, we have acquired our stabled and long-term customer base in the United States, Europe, Australia and South East Asia. We are keen in fabricating custom designed products. Through experience, we gain immense knowledge and thorough understanding on various countries technical requirements; we are comfortable to work to your satisfaction. in a mutual profitable business. Strategy is to gear up quality control, reinforced punctual delivery, offer honest transation at reasonable price, provide good service at a timely manner and build up credibility. External & internal Wall cladding, window sill, lobby flooring, reception counter, granite lift shaft. Kerstone, curbstone, paving stone, column, quion, wall cap, pillar. Kitchen countertops, vanity tops, tub/shower surround, lobby flooring tiles, lift panels, registration counter, bar tables and dimensional slabs. Supplementary products : China bowls, stainless steel sink, towel holder, tissue cabinet, recess paper holders, grab bars etc. Add supplementary products such as bathroom accessories, China Bowl, stainless steel sink etc to convenient customer. Reduce freight cost by combining heavy granite with light supplementary goods. Packed vanity/kitchen tops according to different floor or units to enable more efficient installtion whenever appropriate. Number different granite pieces of kitchen tops to make sure each set has similar color and pattern matching. Clear label on crate to show what is inside. Clear packing list to tell what has been shipped. Each production plant has its QC inspectors, in additional SDC Recruit, independent team of QC to check every shipment before crating. Occupying a total area of 43,000 sq metres (463,000 sq ft). 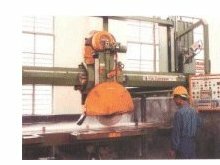 We owned 33 set of round saw machine, 42 set of polishing machine, as well as other Italian machinery. A total output of 25,000 sq metres (269,000 sq ft) of granite products can be produced each month.